Taken in the back playground of the school the photograph shows the cricket team of summer 1950. The headmaster Mr Ternouth and sportsmaster Mr Eastwood are standing at the back. Standing left to right :- Fred Mepham, Peter Edwards, John Comber, Gary Forgham, Derek Green, Kenneth Ede, Christopher Cotton. Team members had proudly received their school badges which mothers had to sew on to their white shirts and remove them every time the shirts were washed. 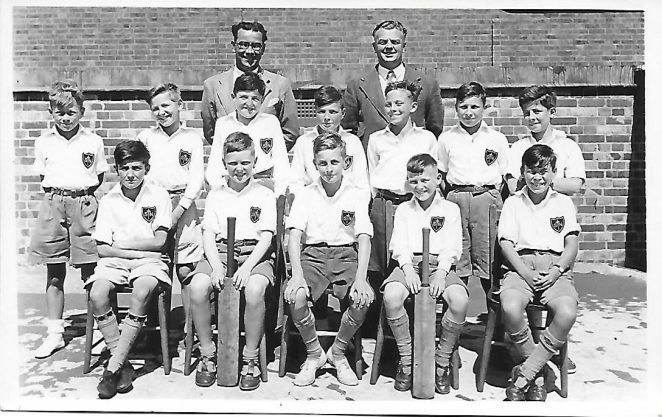 There was a weekly match against other local junior schools and our home matches were played either at Portslade Recreation Ground or in Easthill Park. The Easthill Park keeper would prepare a wicket at the top of the park near the entrance from Mill Cross Road where the boundary was formed by the hedge and a row of enormous Lombardy poplars that grew there at the time. Mr Eastwood would umpire and keep the scorebook. My most vivid memory of the games played there was the hitting of four sixes into the hedge by Stuart Buxton whose junior school in Hove beat us soundly that day. We were later to attend the same secondary school and became good friends.